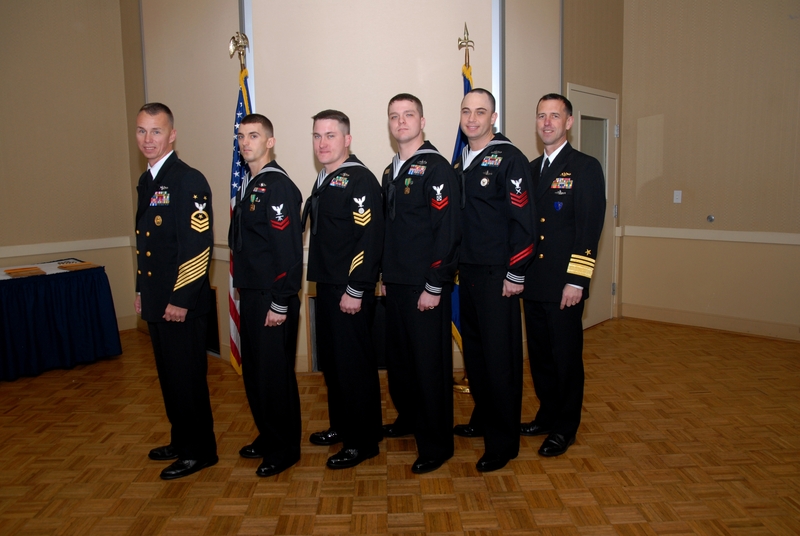 The 2011 Commander, Submarine Force Atlantic (SUBLANT) Senior and Junior Sailors of the Year were announced today. The winners were recognized by Vice Adm. John Richardson, Commander, Submarine Force Atlantic, during a luncheon held at the Vista Point Center at the Naval Station in Norfolk, Virginia. The 2011 SUBLANT Senior Sea Sailor of the Year was Petty Officer First Class William Nagel, a nuclear-trained and submarine-qualified electrician’s mate assigned to the Los Angeles-class attack submarine USS Albany (SSN 753), home ported in Norfolk, Va. The 31-year-old Sailor is from Montgomery County, Texas, and joined the Navy in August 1998. He was also the Commander, Submarine Group Two (CSG2) Senior Sea Sailor of the Year. Petty Officer First Class Scott Biden was recognized as the 2011 SUBLANT Senior Shore Sailor of the Year. He is a submarine-qualified yeoman assigned to staff at Commander, Submarine Group 10, headquartered in Kings Bay, Ga. He was born in Monica, Calif., but raised in Upland, Calif., and joined the Navy in February 2000. The 31-year-old was also the Commander, Submarine Group Ten (CSG10) Shore Sailor of the Year. As the Senior Shore and Sea Sailors of the Year, Nagel and Biden will go on to represent SUBLANT in the Commander, U.S. Fleet Forces Command (USFFC) Sailor of the Year competition. The USFFC competition will be held in March with other Atlantic Fleet type command winners. The Atlantic Fleet sea winner from that competition will be meritoriously advanced to chief petty officer, while the Atlantic Fleet shore winner will enter the Chief of Naval Operations competition in Washington, D.C. The 2011 SUBLANT Junior Sea Sailor of the Year was Petty Officer Second Class Mike Blizzard, a 25-year-old submarine-qualified fire control technician assigned to the Ohio-class ballistic submarine USS West Virginia (SSBN 736), home ported in Kings Bay, Ga. He is from Scranton, N.C., and joined the Navy in February 2007. He was also the CSG10 Junior Sea Sailor of the Year. Petty Officer Second Class Alexander Hiller was honored as the 2011 SUBLANT Junior Shore Sailor of the Year. He is a 25-year-old surface-warfare qualified boatswain’s mate assigned to the staff at Commander, Naval Submarine Support Facility, home based in New London, Conn. Hiller is from Dunkirk, N.Y., and joined the Navy in August 2003. He was also the CSG2 Junior Shore Sailor of the Year.